Three radio stations in the United States mainly broadcast one thing: the official time. The three are radio stations WWV and WWVB, in the state of Colorado, and WWVH, on the island of Kauai in Hawaii. They send out signals that are used by millions of clocks and other time-keeping instruments around the country. The federal government launched the service shortly after World War II. WWV, WWVB and WWVH are part of the U.S. National Institute of Standards and Technology, or NIST. Still needed or important addition to satellites? 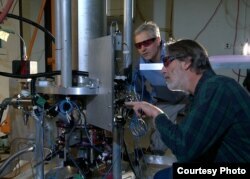 NIST physicists Steve Jefferts (front) and Tom Heavner with the NIST-F2 “cesium fountain” atomic clock, a new civilian time standard for the United States. Yet the administration of President Donald Trump has offered a plan to close them down. Experts argue that they are no longer needed. They say the government’s Global Positioning System (GPS) also transmits time signals. The GPS is made up of satellites orbiting high above the Earth. Its signals are able to be received all over the world. Some users, however, disagree. They note that GPS connected devices must have an unobstructed view of a number of satellites to work correctly. Whenever the signal is blocked, the devices are unable to keep the correct time. Sullivan told VOA that land-transmitted radio signals are different. “Sixty kilohertz permeates in a way GPS can’t,” he said. Sullivan said that WWVB’s very low frequency signal can be received inside buildings. He added that the radio service helps to back-up the GPS system. WWV and WWVH broadcast on a number of shortwave frequencies, which can be heard in many parts of the world. The stations use an extremely accurate atomic clock to keep the official time. The Trump administration has asked Congress to cut about $26.6 million and 136 jobs from NIST’s budget. That amount includes the cost of operating the timekeeping stations. The budget request, however, does say that broadcasts not only are used by clocks and watches, but also by appliances, cameras and irrigation controllers. WWV is perhaps the oldest continuously operating radio station in the United States. It started broadcasting in Washington, D.C. in 1919. In its early years, it played music, sent out news reports from the Agriculture Department and carried out shortwave propagation experiments. The station later moved to Maryland and then, in 1966, to Colorado. It has been used as a frequency standard since 1922 and has broadcast the official time since 1944. In addition to the time, WWV transmits a musical note, A above middle C, at two minutes past every hour. It has done this since 1936. The note can be used by musicians to tune their instruments anywhere in the country. Sullivan says all three radio stations remain popular around the world. WWV and WWVH broadcasts also are available on the telephone. NIST says they get about 2,000 calls every day from people who want to set their clocks. Tom Kelly is a radio operator in the state of Oregon. He has launched a campaign to get 100,000 Americans to sign a document in support of the radio stations. He calls the stations “an instrumental part in the telecommunications field” for scientific research and education. Steve Herman reported this story for VOA News. Mario Ritter adapted his report for Learning English. George Grow was the editor. (WWV and WWVH broadcasts can be heard by phone by dialing +1-303-499-7111 or +1-808-335-4363).We want to hear from you. Write to us in the Comments section, and visit our Facebook page.